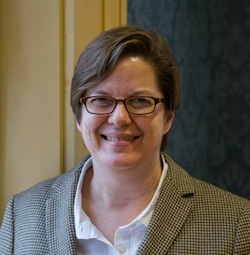 Jaime Harker is professor of English and the director of the Sarah Isom Center for Women and Gender Studies at the University of Mississippi, where she teaches American literature, LGBTQ literature, and gender studies. She has published essays on Japanese translation, popular women writers of the interwar period, Oprah’s book club, William Faulkner, Cold War gay literature, and women’s liberation and gay liberation literature. She is the author of America the Middlebrow: Women’s Novels, Progressivism, and Middlebrow Authorship Between the Wars and Middlebrow Queer: Christopher Isherwood in America, and the co-editor of The Oprah Affect: Critical Essays on Oprah’s Book Club, 1960s Gay Pulp Fiction: The Misplaced Heritage, This Book Is an Action: Feminist Print Culture and Activist Aesthetics, and Faulkner and Print Culture. Her third monograph, The Lesbian South: Southern Feminists, the Women in Print Movement, and the Queer Literary Canon, will be released in the fall of 2018 by the University of North Carolina Press. Middlebrow Queer: Christopher Isherwood in America. Minneapolis: U of Minnesota P, 2013. 1960s Gay Pulp Fiction: The Misplaced Heritage. Drewey Wayne Gunn and Jaime Harker, editors. Amherst: U of Massachusetts P, 2013. America the Middlebrow: Women’s Novels, Progressivism, and Middlebrow Authorship Between the Wars. Amherst: U of Massachusetts P, 2007. The Oprah Affect: Critical Essays on Oprah’s Book Club. Cecilia Konchar Farr and Jaime Harker, editors. SUNY Press, 2008. “The ‘New’ Gay and Lesbian Literary Studies.” Published in American Literary History. Forthcoming Spring 2010. “Introduction: The U.S. South and the Pacific Rim.” Published in The Global South. Forthcoming Spring 2010. “’And You Too, Sister, Sister?’: Absalom, Absalom, Lesbian Sexuality, and the Remaking of the Southern Family.” Faulkner’s Sexualities: Faulkner and Yoknapatawpha, 2007 (Faulkner and Yoknapatwapha Series). Jackson: Mississippi UP. Annette Trefzer and Ann Abadie, editors. Forthcoming, March 2010. “Oprah, James Frey, and the Problem of the Literary.” The Oprah Affect: Critical Essays on Oprah’s Book Club. Cecilia Konchar Farr and Jaime Harker, editors. SUNY Press, 2008. “American Literature, 1945-present.” International Encyclopedia of Queer Culture. David Gerstner, editor. Routledge. 2006. “’You’ll Never Write in This Town Again’: Standards and K-16 Collaboration.” English Teachers at Work: Narratives, Counter Narratives and Arguments. Brenton Doecke, David Homer, Helen Nixon. Kent Town: Wakefield Press and the Austrailian Association for the Teaching of English, 2003. 65-74. “Progressive Middlebrow: Dorothy Canfield, Women’s Magazines, and Popular Feminism in the Twenties.” Middlebrow Moderns: Popular American Women Writers of the 1920s. Lisa Botshon and Meredith Goldsmith, editors. Boston: Northeastern UP. 111-134. “‘Pious Cant’ and Blasphemy: Fanny’s Fern’s Radicalized Sentiment.” Published inLegacy: A Journal of American Women Writers. (18.1) 2001. 52-64.